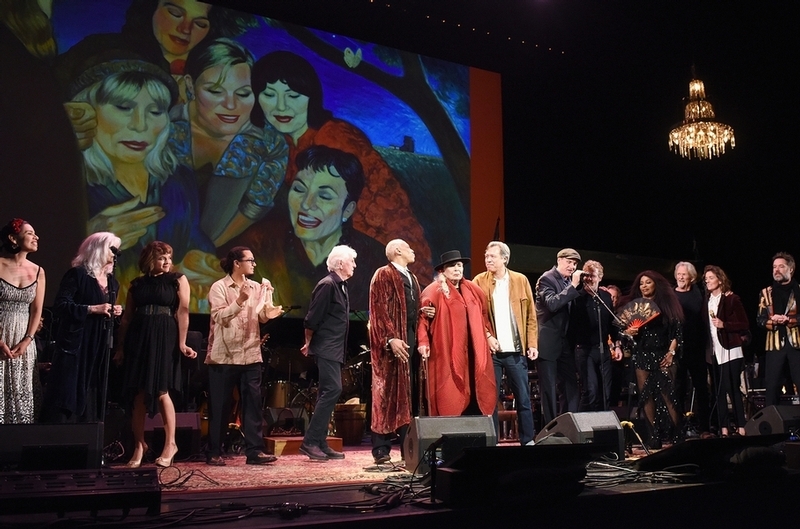 [Vivien Killilea/Getty Images for The Music Center] Emmylou Harris, Norah Jones, Graham Nash, Charles Valentino, Joni Mitchell, Sauchuen, James Taylor, Glen Hansard, Chaka Khan, Brandi Carlile, Kris Kristofferson and Rufus Wainwright perform onstage at Joni 75: A Birthday Celebration Live At The Dorothy Chandler Pavilion on Nov. 7, 2018 in Los Angeles. Half way through Joni 75: A Birthday Celebration Live at the Dorothy Chandler Pavilion, a concert feting Joni Mitchell's birthday in Los Angeles Wednesday night (Nov. 7), Peter Gabriel appeared in a video to wish Mitchell the happiest of birthdays -- but also to express his condolences to the "poor bastards" who had to sing Mitchell's songs in front of the legend. His concern was understandable: Mitchell, one of the greatest living songwriters and musicians, is known -- and loved -- for her notoriously complex song structures. The Canadian artist's material comes with a high degree of difficulty, often shape-shifting on a glorious whim within its sophisticated embrace of jazz, pop, blues and rock. Luckily for the musicians and the rapturous audience, most came with the requisite skills to tackle such challenges. Norah Jones opened the evening with a lovely version of "Court and Spark," followed by Glen Hansard's clever reading of "Coyote," one of Mitchell's deeply humorous works about a lecherous ladies' man. The evening lifted higher as Diana Krall interpreted "For the Roses" with a spare, confident grace that almost felt like a meditation at times. She returned in the second half for a bewitching reinvigoration of "Amelia." Rufus Wainwright -- who proudly pointed out that his husband, Jorn Weisbrodt, was the evening's artistic producer -- offered up a soaring version of 1971 title track "Blue" as if it were a sacrifice. His voice slid up and down the melody, caressing the lyric. While all the performers clearly felt some connection to Mitchell, it was Wainwright who channeled Mitchell's spirit the best, as if she had temporarily taken possession of his body during "Blue" and his second number, "All I Want." Los Lobos added even more rhythms to the buoyant "Dreamland," with La Marisoul, front woman for La Santa Cecilia, delivering a blistering lead vocal as the propulsive beats -- and Chaka Khan, who joined in the song -- swirled around her. Seal closed out the first half with a brilliant version of one of Mitchell's best-known compositions, "Both Sides Now." With the sparest of accompaniments, his voice seemed to reach every corner of the theater. Khan seemingly spoke for all the participating artists, whose reverence for Mitchell was palpable, when she thanked Mitchell from the stage, adding "I just want you to know how many times you've saved my life and I want you to know if you need me, I'm here," before delving into a free-ranging, jazzy version of "Help Me." While much of the show featured artists a generation removed from Mitchell, some of her contemporaries provided the top highlights. Emmylou Harris performed "Cold Blue Steel," a song about heroin addiction, saying, "Joni is an inspiration for every girl who ever wanted to pick up a guitar." (Harris also clarified that "Steel" had "too many chords" in it for her to play it herself.) She then grabbed her guitar for the horribly sad "The Magdalene Laundries," about a young incarcerated nun. Mitchell's former lover Graham Nash performed the only song of the evening not written by the artist herself, when he pulled out Crosby, Stills, Nash & Young's "Our House," a radio classic written for Mitchell by Nash when they lived together. He was 27 and she was 26, he explained, as a photo of the couple looking impossibly young and in love flashed up on the screen. Another one of Mitchell's exes, James Taylor, performed a wistful "River," the now-seasonal tune that he began playing decades ago. He returned for an almost mystical take on "Woodstock," with Seal providing otherworldly backing vocals. Kris Kristofferson tackled one of Mitchell's most romantic songs, "A Case of You," with sweet assistance from Brandi Carlile, who guided Kristofferson through the track, while trading verses. "Kris said to me backstage, 'You know, I don't remember all that much,' and I asked ' But what do you remember about Joni?'" Carlile said from the stage. Kristofferson replied, "Only everything, and she is perfect in every way." After her duet with Kristofferson, Carlile sang "Down to You," her pristine upper register eerily reminiscent of a young Mitchell's. The artists were backed by an exceptionally talented band that included drummer Brian Blade, pianist Jon Cowherd, guitarist Greg Leisz, percussionist Jeff Haynes, trumpeter Ambrose Akinmusire and saxophonist Bob Sheppard. The evening, which drew a crowd including celebrities Tom Hanks, Rita Wilson, Anjelica Houston, Jon Hamm, Angela Bassett, Cameron Crowe, and David Geffen (Mitchell's former agent and label head and the subject of "Free Man in Paris," which was not performed), closed with the performers coming together for a delightfully disheveled "Big Yellow Taxi" -- which originally stalled at No. 67 on the Billboard Hot 100 in 1970, but ultimately grew into one of Mitchell's best known hits. The curtain went down and, after a long pause, rose to reveal Mitchell standing on stage. It was a moving sight given that she has rarely been seen since suffering a brain aneurysm in 2015. As the band reprised "Big Yellow Taxi," Mitchell smiled as she occasionally mouthed the words and received visitors -- including Nash, who bowed and kissed her on the hand -- while bathing in the love of her fellow artists and adoring fans. Wednesday's performance was followed by a gala dinner with served as a fundraiser for The Music Center, which houses the Dorothy Chandler Pavilion and several other theaters. A similar performance look place Tuesday with the same performers. This article has been viewed 632 times since being added on November 9, 2018.